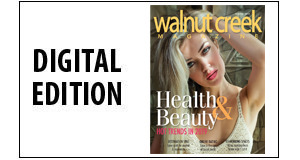 There’s no doubt that Walnut Creek is in the midst of a food boom. With at least fifteen new restaurants slated to open by the end of 2017, we decided to get to know some of the owners and chefs that are bringing their food legacies to our city. Here we talk to three Walnut Creek newcomers—Tony Gemignani at Slice House, Eddy at Fuego, and Chris Jarosz at Broderick. 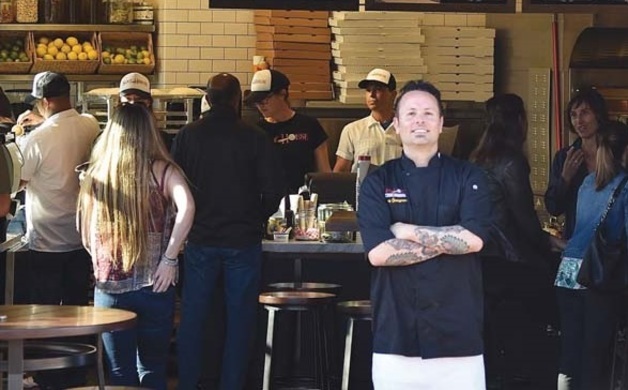 Twelve-time World Pizza Champion Tony Gemignani thought it was high time to expand his pizza empire to the East Bay. For a location he chose the ground floor of 1500 Mt. Diablo, the stunning new brick building on the corner of Mt. Diablo and Main. His new Slice House features grab-n-go $5 slices, pies, pasta and new signature items like bourbon barbecue wings, meatball subs and disco chili cheese fries. Cold pressed juices, granola and stuffed sandwiches line the breakfast menu. “I was born and raised in Fremont and have wanted to bring our Slice House concept to the East Bay ever since I moved back to the area over a year ago,” says Gemignani. “We’re excited about our expanded growth into a new neighborhood with such a strong sense of community." The pizza is delicious and worth every cent. The Cal Italia, a Food Network Gold Medal Winner, comes with asiago, gorgonzola, mozzarella, sweet fig preserve, prosciutto and a balsamic reduction. Another is the Purple Potato, which in addition to the crisp potato slices comes topped with shredded mozzarella, pancetta, rosemary, pesto, feta, oregano, Romano and garlic oil. Slices range from standards like cheese and pepperoni to specials of the day like the Popeye with spinach, garlic ricotta and mozzarella. Gemignan’s passion for pizza began in 1991 working at his brother’s acclaimed Pyzano’s Pizzeria in Castro Valley. Fresh out of high school, Gemignani took on the task of pizza thrower, entertaining the restaurant’s customers with his wily tricks. Before long his talent for throwing earned him national attention and appearances on The Tonight Show with Jay Leno, Good Morning America, and Food Network. He received his Master credentials from the Scuola Italiana Pizzaioli and runs the International School of Pizza where he certifies chefs from around the world. His most impressive accolade to date is being named the official U.S. Ambassador of Neapolitan Pizza by the city of Naples, a prestigious title only given to three people in the world. In 2009, Gemignani fulfilled his lifelong dream by opening Tony’s Pizza Napoletana in San Francisco’s North Beach neighborhood hand-crafting Classic American, Italian, Sicilian and Neapolitan pizzas. From there Gemignani expanded his restaurant empire to sixteen pizzerias across the country. He lives with his wife and son in their San Francisco and San Ramon homes. Plans are underway for an outdoor patio area adjacent to the restaurant. 1500 Mt. Diablo Boulevard, slicehousewalnutcreek.com. All too often, what passes for Mexican food in this country is tempered to suit American palates; it can be hard to make out the flavors beneath all that melted cheese and sour cream. Brothers Javier and Eddy Schmitt dreamed of bringing the high quality Mexican food they grew up eating at home to Walnut Creek. 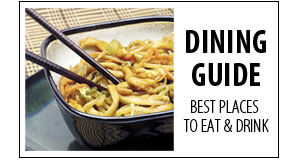 Food that isn’t just good, but respectful of tradition. For inspiration, they turned to their grandmother, Aurora Diaz, for her family recipes from Michoacán, Mexico. Together they opened Fuego Tequila Grill on Locust Street. “We have real pride in this food because we have family ties to it,” says Eddy. “This is the food we’ve eaten since we were born.” Eddy has consulted on numerous restaurants over the years and Javier has a background in accounting. Their chef, Marta Lopez, is a family friend who learned how to cook the family’s recipes directly from Grandmother Diaz. And their grandmother, who also lives locally, keeps a watchful eye on the place. “She’ll come in without telling us and taste the food, and if it’s not right, she yells at us,” says Eddy. 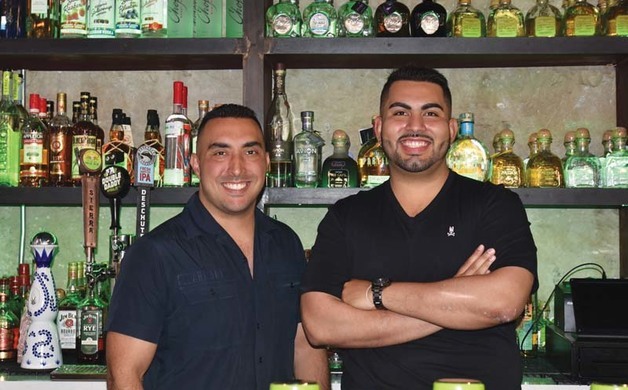 The brothers are equally proud of Fuego’s bar which boasts the best tequila selection in town—stocked with almost 100 tequilas—including one made specifically for them by Patron, and one found at only 10 restaurants in the world that goes for $1100 a shot. Syrups and garnishes for the array of craft cocktails are fresh squeezed and house-made. The Phoenix Fuego Margarita—Patron Silver Tequila, fresh squeezed pineapple juice, house made sweet & sour mix from fresh squeezed fruit, muddled habanero, topped with house made hibiscus tea ($12.00)—is a best-seller. The Suntan Martini is made with fresh squeezed cantaloupe, lime juice, rosemary and Stoli vodka ($10). 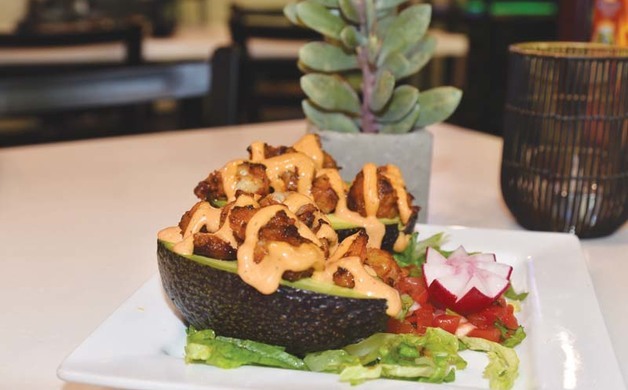 Must-tries on the menu include the avocado stuffed with expertly-spiced tiger prawns and topped with a chipotle mayo ($13.95); and an addictive mole sauce served on a free-range chicken breast ($16.95). Hailing from the Puebla region of Mexico, some of the ingredients in grandma’s secret mole sauce recipe include pine nuts, sesame seeds, four types of chili peppers, two varieties of bananas, cocoa and Mexican chocolate. In addition to favorites like luscious carnitas and stuffed tacos, lighter fare on the menu includes a tangy citrus and avocado salad with pine nuts and beet cubes, topped with wild salmon or tiger prawns ($19.95). Much of the produce at Fuego is organic; the salmon is wild and the beef is grass-fed. Tequila-lime marinades and grilled meats like top-quality arrachera steak are big showings in the quesadillas, burrito bowls and even the nachos. The restaurant’s wait staff of “Angels” figure prominently into the scene “adding to the atmosphere and making sure customers have a great time,” says Eddy. But the food is what draws people in. “When the older generation is gone, we’ll have this food and a place we can eat it,” says Eddy. The brothers plan to open restaurants in San Francisco and San Ramon in the coming year. 1359 Locust Street, fuegotequilagrill.com. It’s easy to forget that just a few short months ago this hip new restaurant was a classic 50’s-style diner on the corner of Locust and Bonanza streets. But owners and siblings Rolla and Mike Ghaben, in partnership with Broderick Roadhouse concept creator Chris Jarosz, have transformed Hubcaps into a modern, rock-n-roll space with creative updates on classic diner fare. No one will mistake the food at Broderick for healthy fare. Chris Jarosz calls it “mental health food,” which he says is just as important. The massive portions are over-the-top and everything is made from scratch. Burgers bursting with flavor (made with Niman Ranch beef, $11-$14), include the “Johnny Cash,” which comes oozing with cheddar cheese, thick strips of bacon, pickled sweet peppers, crispy onions and house-made barbecue sauce; a duck burger with fig jam; a lamb burger with Middle Eastern spices; a boar burger; a bison burger and of course, a veggie burger. The jumbo wings ($14 half dozen, $21 dozen) are big, juicy and prepared East Coast-style. Basic unadorned French fries are called “naked fries,” but why order them when you can get garlic fries, buffalo bleu fries, gravy fries, chili cheese fries or gorgonzola mushroom fries? The top-selling banh mi fries ($10) were accidentally created when a chef dropped the fixings for a classic Vietnamese banh mi sandwich onto a plate of French fries—the combination of the pulled pork, pickled daikon and carrot, Vietnamese citrus-caramel sauce and fresh jalapenos and cilantro on top of fried potatoes is unbelievable. A selection of salads from flank steak ($14) to kale Caesar ($12), custard shakes, both with booze ($13) and without ($7), and a large selection of other sandwiches round out the menu. There’s also weekend brunch and a full bar. Jarosz’ culinary inspiration comes from growing up “in the sticks” of Pennsylvania where his family did a lot of pickling and preserving, something he continues today. After leaving a career in the mortgage business, friends pitched in and helped Jarosz buy a “rustbucket” that he converted into the “Wicked Wich’ food truck. One of the first in the Sacramento area, the food truck did so well he started looking for a brick and mortar restaurant. 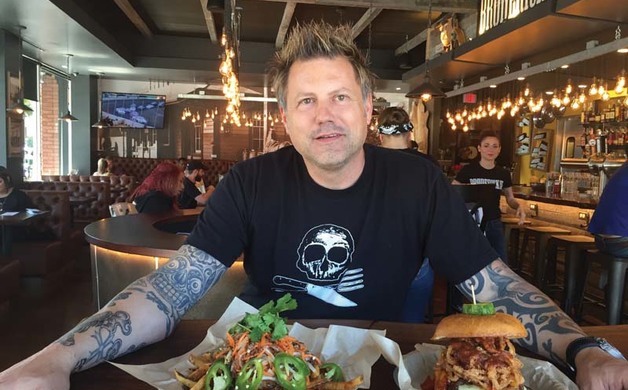 In 2012, Jarosz opened Broderick Roadhouse in West Sacramento—named after the neighborhood and an anti-slavery activist—in an area of town under curfew due to gang violence. A year later, Jarosz won a civic pride award and his restaurant became the pride of the neighborhood. A second location soon followed in midtown Sacramento. 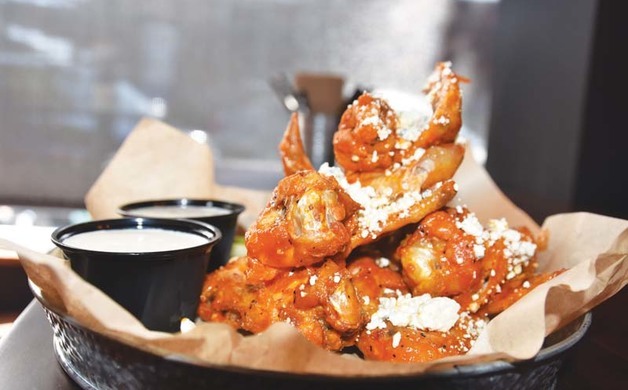 Rolla Ghaben says “We think it’s a great concept with great food and everything is made from scratch.” Beyond the food, the Broderick experience is casual and fun, with a soundtrack of classic rock, craft beer on tap, and big screen televisions. Plans for locations in Pleasanton and Lafayette are already in the works. 1548 Bonanza Street, broderickroadhouse.com.